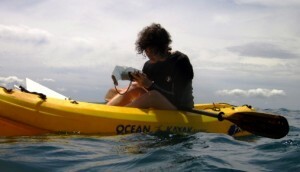 I am a 29-years-old Italian marine biologist fond of living nature and sea life. My passion for animal communication was born 15 years ago when I had the chance to ra ise andtrain different species of parrots, getting acquainted with the observing of their behavior and with the listening of their sounds. My interest in wild life, both terrestrial and marine, has never stopped to grow and it made me travel all around the world to observe animals in their habitat. Now I have the chance to work in one of the most beautiful and fascinating place of the world: coasts of Namibia! 2008: University of Rome (Italy) – MSc – With Distinction: “Study of the acoustic repertoire of wild dusky dolphin (Lagenorhynchus obscurus) groups of in Golfo Nuevo, Argentina.” Supervisors: Prof Marina Cobolli & Dr. Fabrizio J. Borsani. 2005: University of Rome (Italy) – BSc – With Distinction: “The recovery of Posidonia oceanica meadows through re-implantation techniques.” Supervisor: Prof Gian Domenico Ardizzone. My main interests are dealing with animal communication and animal beahviour; in the past years I had the opportunity to focus my studies on two poor known species of dolphins: dusky dolphin (Lagenorhynchus obscurus) and Commerson’s dolphin (Cephalorhynchus commersonii). Moreover I collected data on behaviour/sound production of Stenella longirostris dolphins in presence/absence of eco-touristic vessels. Now I am giving my contribute to understand Namibian dolphins behaviour also through the analysis of their vocalizations, as every single aspect of the ecology of these animals has to be understood to build a solid background of knowledge to guarantee their conservation. “GFCM 1952-2012: 60 years serving Mediterranean and Black Sea.” 2012. FAO/GFCM Secretariat.